THE Greencastle to Magilligan ferry resumed service bright and early this morning providing 15 new summer jobs for the area. The long-awaited car ferry will provide a continuous daily shuttle service across Lough Foyle throughout July and August. It will see the popular 'Foyle Venture' vessel return to the waves as a familiar sight for the rest of the season. The journey takes approximately 10 minutes each way depending on weather and tidal flow. The new operators are Limerick-based Frazer Ferries who told Inishowen News that 15 full and part-time jobs including captain and ticket collectors had been created with the resumption of the service. The company also announced that fares are 20% cheaper this year compared to 2015. A single car crossing costs €12/£10 and a return €16/£13. A multi-trip ticket with six single crossings can be purchased for €40/£32. The 'Foyle Venture' car ferry departing Greencastle, Co Donegal, en route to Magilligan Point, Co Derry. Frazer Ferries secured the tender to operate the service for the next three years with the option of a further four years. Company director, Boston-born John Driscoll, said the company is "very excited" about taking over the local service. "Everyone has worked very hard, long hours to get to this point and we are very excited to get going. The boat is in great condition and we look forward to welcoming passengers aboard," said Mr Driscoll. The service will run from 8am-8pm for the rest of this week. 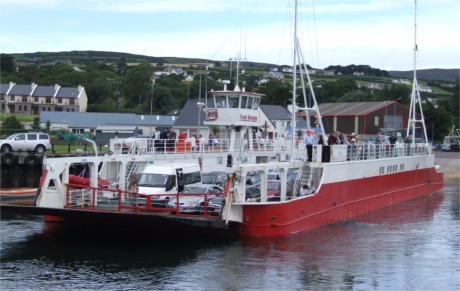 The regular sailing times for the rest of the summer will be: Depart Greencastle daily at 7am with the last sailing from Magilligan each evening at 9.45pm. The ferry office can be contacted on 074 93 81901.